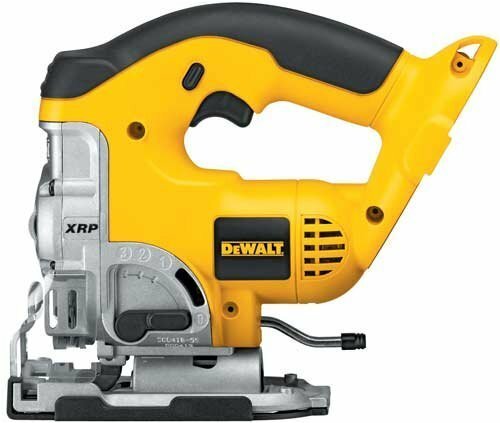 The DeWalt DC330 is a 18V Heavy-Duty XRP Cordless Jig Saw Kit Tool Only. The Jig Saw consists of keyless blade change system that accepts universal and t-shank blades. The tool free adjustable shoe slides forward, backward and bevels 45º in both directions. It has a 3-position orbital action with unique counter-balance mechanism. The jig saw has a variable speed trigger 0-2000 SPM for greater control and faster cutting. A dust blower keeps line of cut clear of chips. No additional includes. Bare tool ONLY. My only complaint about this tool is that I don't know what makes it so much more special than the other tools like the circular saw, impact driver, grinder, etc. to make it considerably more expensive. Other than that it is solid and cuts wonderfully. I have a problem with the T-shank blades staying in. This could be my inexperience with proper insertion. I like the tool. After using B&D, Skil, & Craftsman jigsaws for all my remodelling and furniture (primarily oak and cherry Queen Anne designs), I finally bought this baby, and WOWWIE! it's like a fine surgeon's scalpel compared to a toy hatchet! Unbelievable what control you have with this saw--your blade runs true and doesn't warp or go offtrack. Wish they would add a laser guidance light to it. 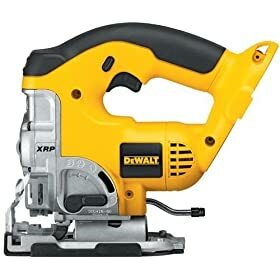 I am getting started in woodworking and purchased a Dewalt drill and needed a Jig Saw . Since the drill comes with 2 batteries - I looked at the Dewalt Jig/tool only. I was impressed with the shipping and how sturdy the Jig Saw is . I used it on a book case project I did and it worked very well. I am very pleased with the purchase I made. Just wanted to let everyone know that this jigsaw is just great. DeWalt have come out with a fantastic product here. I'd rather use this than any corded jigsaw, it does such a great, quick job.